Use the menus or search bar to find the topics you’re interested in. Check out our videos for illustrations and examples for how to perform important tasks. If you need support, follow the instructions below. 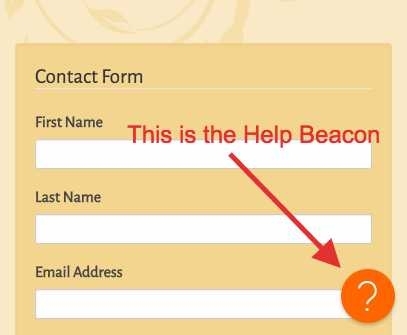 The best way for an existing customer to request support is to use our Help Beacon (the question mark in the bottom right corner of any page on your website) or you can call us at 541-746-6418. Support requests submitted via our Help Beacon will go into our Webhelp support system, provide important information about your request, and allow us to route the request to the best person on the staff to serve you. Anyone may report a problem with your site, but for your security, change requests must be submitted by an authorized user. If we receive a request from someone we don’t recognize, or an outside consultant, we will ask for authorization before proceeding. Share with us what steps you have already taken to troubleshoot the problem. We’ll be able to fast forward to dig in deeper, bringing a swifter resolution to your issue. Include your website’s URL, as well as links to the page(s) in question. This will guarantee that we’re all on the same (web) page. Capture a screenshot of the problem so that we can see what you see. On a PC, hit the PrtScn key on your keyboard or use the Snipping tool. On a Mac, press ⌘+shift+3. The image will automatically save to your desktop. Once you have saved a screenshot, you should be able to attach it to your webhelp email. Report what browser (and version) you’re using. For example, “Chrome 25” or “Firefox 19.” To find this information, simply go to the About menu of the web browser application. In short, the more specific you can be, the more efficiently we can help you solve the issue. We will respond to most webhelp requests within two hours and strive to answer all requests within one business day. If your request is urgent, please include the word “urgent” in the subject of your message. A support person will be paged with your urgent issue. If you submit a request in the evening or on the weekend we will generally respond the next business day unless you indicate the request is urgent.